The Indonesian National Transportation Safety Committee (NTSC), published a preliminary report of their investigation into the cause of the accident involving a Lion Air Boeing 737-800 near Bali, Indonesia. 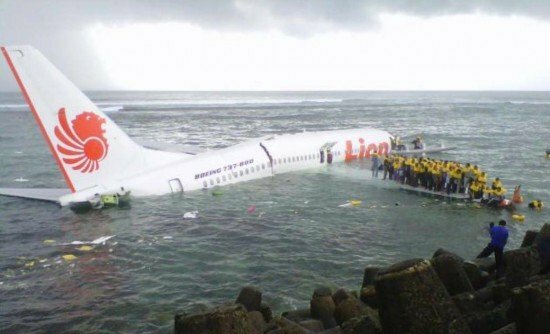 On April 13, 2013 Lion Air Flight JT-904 crashed into the sea just 300 meters short of the runway threshold while on final approach to the Denpasar-Ngurah Rai Bali International Airport, Indonesia. There were 101 passengers and seven crew members on board. All aboard survived. The flight departed Bandung with the copilot as Pilot Flying. About 15:00 the flight was descending towards Bali and the crew received vectors for a VOR DME approach for runway 09. At 15:08, with the aircraft at approximately 1,600 ft AGL, the Tower controller saw the aircraft on finals and gave a landing clearance with additional information that the wind condition was 120° at 5 kts. While descending through 900 feet the copilot stated that the runway was not in sight. At 15:09:33, after the EGPWS called out “Minimum” at an altitude of approximately 550 ft AGL, the pilot disengaged the autopilot and the auto throttle and continued the descent. Twenty seconds later, at 150 ft AGL the captain took over control. The copilot handed the control to the captain and stated that he could not see the runway. At 15:10:01, the EGPWS called out “Twenty”, and the captain commanded a go around. One second later the aircraft impacted the water. To review the policy and procedures regarding the risk associated with changeover of control at critical altitudes or critical time.